As I expected there were quite a few vendors selling succulents in planters, also tillandsias and tropicals. A range of materials were represented, some of them used in typical ways, others newer; from top left, clockwise: Succulents in rusted tin cans, the better to go with a rusted backdrop and a dia de los muertos painting; graphically painted chunks of wood planted with petite sculptural haworthias; teardrop terrariums filled with tillandsia mini-worlds; tropicals trussed and rooted in natural materials, dangling jauntily; simple hypertufa vessels with glass tile decorations; tillandsias (trussed again) with bendable wire on wood veneer panels; a ‘fishing cottage’ aflame with succulent color; modish laser cut wood and test tube vases. Prices were accessible and, again, seemed geared to the young apartment dweller. Furniture offerings fell into two categories: vintage and industrial, and sometimes both at the same time. There were lots of upcycled, recycled and reworked examples to choose from. 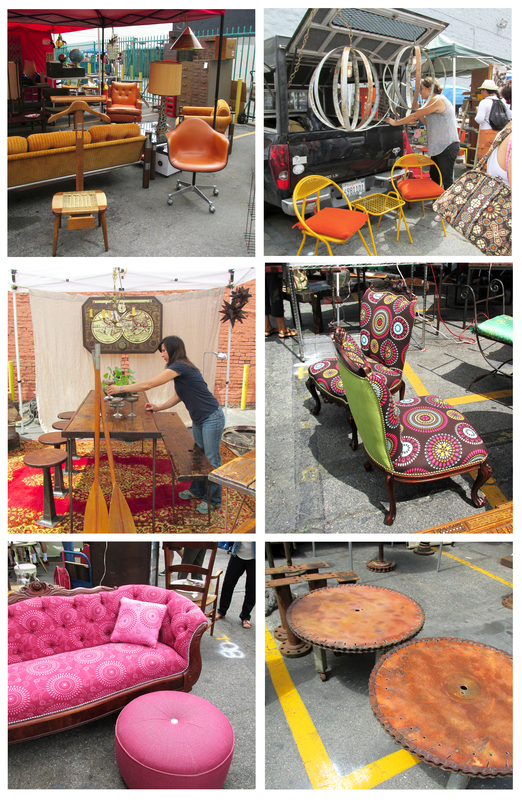 Some eye-catching examples, from top left, clockwise: Midcentury and ’60s-era pieces abounded, along with reworked lighting and office storage options; repainted garden furniture showed off bright new coats; formerly-staid upholstered pieces boasted bold new fabrics and shiny nailhead trims; big wheels keep on turning as low tables with sturdy wheeled legs; Gran’s old sofa sports eye-popping upholstery, this time in a hot raspberry print; a muscular industrial dining table in steel and reclaimed wood faces off against a similar bench and sturdy factory stools. Prices? Reasonable. I really enjoyed these reworked lighting options incorporating industrial and found elements. They had a masculine, almost sinister feel and would provide perfect illumination for those “IT’S ALIIIIVE! !” moments in the laboratory, or maybe the man cave. 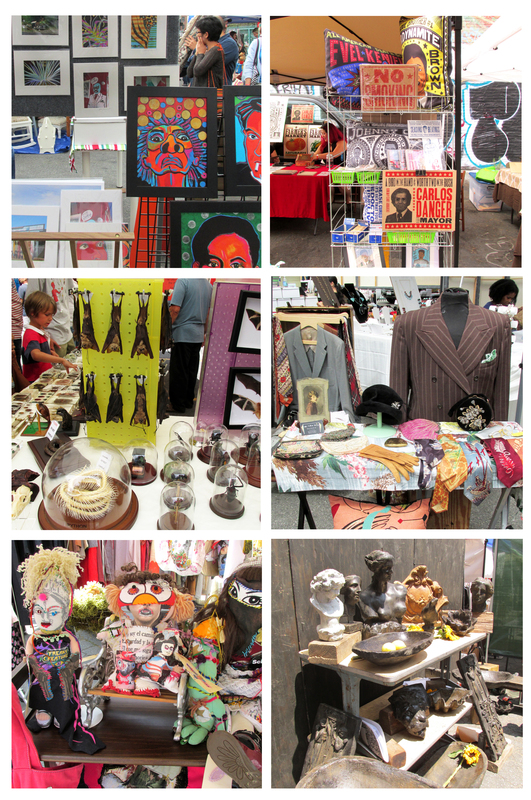 Of course, every flea market is only as good as its stuff … the goods you won’t find at the mall or a department store. There was a lots to like, here’s a small sampling; from top left, clockwise: The perfect low-cost art solution, framed photos and artwork; silkscreened decorative posters, pillows and other items showcase classic and funky typography; vintage clothing and accessories for stylish dolls and dandies; sculptural garden and decorative items made of marble dust; creepy-cute dollies for progressive children and voodoo priestesses; freeze-dried bats, coiled snake skeletons and insects mounted and framed — a draw for kids of all ages. 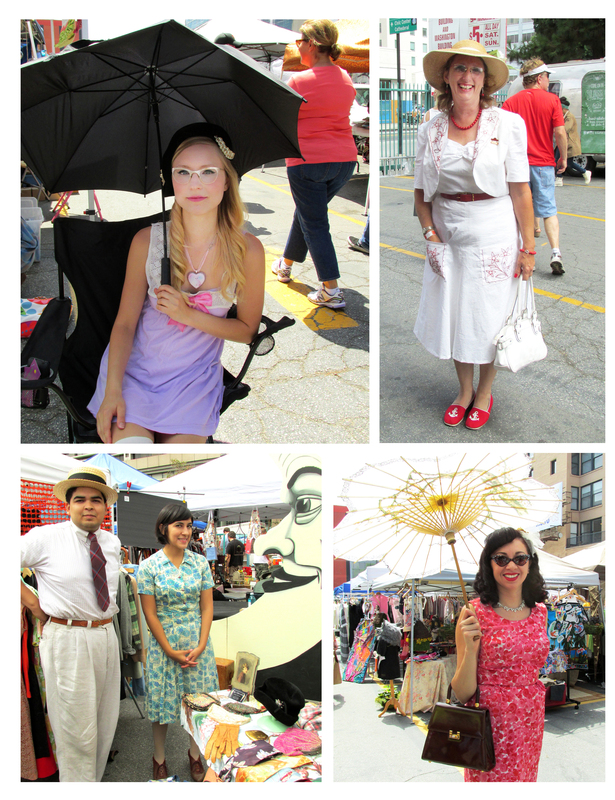 Back to people watching: If ogling hipsters is your hobby, you must come to this flea market. I observed one young woman wearing pieces from what seemed like every recent decade (zebra-print M.C. Hammer diaper-crotch pants, leather bra top, sky-high plastic platforms with flowers inside them) twist and toss her oily-on-purpose mop into the right state of tangled-ness to go with her Golden Girls-approved sunglasses. Sadly, I was so mesmerized by her primping that I forgot to raise my camera. However, I did capture these fashion plates and their more coherent looks; from top left, clockwise: With perfectly airbrushed complexion, this charming young lady was wearing a lilac baby doll while selling doctored photos of kosmic kitties shooting death rays from their eyes; seemingly on her way to the Aimee Semple McPherson tabernacle, this shopper proudly told us she sewed her outfit from a vintage pattern; vintage handbag at the ready, this ladylike shopper protected her complexion with a paper parasol; this hard-working couple was selling an array of items, as well as offering their portable paper moon backdrop for photographs at your next depression era-themed party. So what did we buy? Not much. I can’t carry virtually anything, so we kept it light, picking up mostly food sauces and preserves (strawberry-chipotle jam, anyone?). 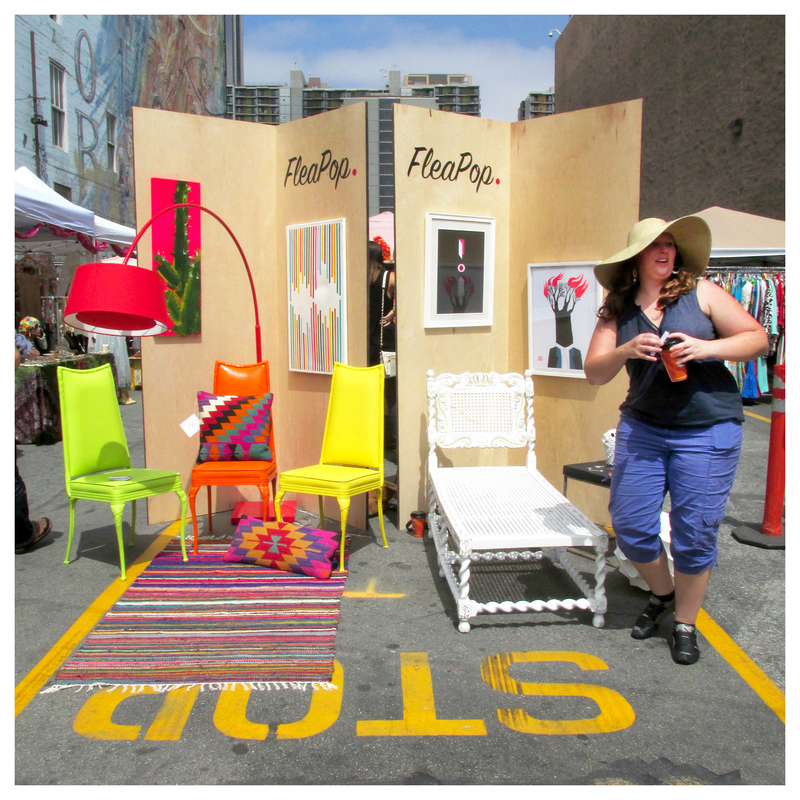 Will I return to the Downtown Flea? Yes, ma’am! I have a feeling it will get better as time passes. Along with what I’ve shown here, there were also food trucks, DJs, face painting, climbing wall and food vending booths. For information and to learn more about where the flea would like to go, click here. I was wondering if you were going to post on this flea. Glad to find it getting a thumb’s up from you. If I’m in town August 25 I’ll be there. Don’t blame me if you have to buy more LAND!